On October 6th, 1843, Longfellow reached London and came at once to Devonshire Terrace. "I write this from Dickens's study," he told Sumner. "The raven croaks in the garden; and the ceaseless roar of London fills my ears." He spent the morning replenishing his wardrobe from the fashionable tailors, bootmakers, and hatters of Piccadilly and Bond Street, but in the afternoons and evenings Dickens involved him in a round of entertainment. The very evening of his arrival Dickens took him to see Macready in As You Like It and they visited Macready in his dressing room after the performance. With Cruikshank, Maclise, and Macready there were "dinners in Devonshire Terrace, at which they drank Schloss-Johannisberger and cold punch, and other evenings equally merry beneath Forster's bright dinner lamps in Lincoln's Inn Fields...At one of their few quiet evenings in Devonshire Terrace,"the phlegmatic poet," as Dickens jocosely called him, shared a plump brace of partridges and a stewed steak with his host and Henry Austin. In contrast to London's artistic and fashionable circles, Dickens gave Longfellow a lurid nocturnal glimpse of its criminal slums. Accompanied by Forster and Maclise, and guided by officers supplied through the courtesy of Chesterton and Lieutenant Tracey, they explored the foulest and most dangerous thieves' dens of the Borough. On entering the very first of the Mint lodginghouses there, Maclise's stomach was so turned by the filth and stench that he was taken with a violent fit of vomiting and had to remain outside under the guardianship of the police while the others subjected themselves to the full horrors within. 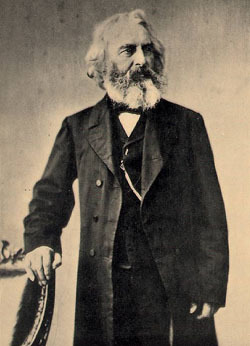 At the end of two weeks Longfellow set out for Bristol, where he was taking the steamship Great Western on the 21st. Forster wanted to give him some bottled port wine to take back to America, but Dickens, remembering the Britannia plunging and shuddering through the waves, vetoed the suggestion. "No -- no! -- the Port will be shaken to the devil before it gets there." Longfellow was entrusted, however, with some Johannisberger and punch for Dickens's friends across the Atlantic. With this he took copies of American Notes, which was just off the press, for Felton, Sumner, the elder Dana, Washington Allston, Bancroft, Prescott, and Chapman. "I was but poorly received," Dickens later wrote Longfellow, "when I came home from Bristol that night, in consequence of my inability to report that I had left you actually on board the Great Western; and that I had seen the chimney smoking...After you left us, Charley invented and rehearsed with his sisters a dramatic scene in your honour..."It consisted of a ceremony of drinking healths. "The three small glasses are all raised together, and they look at each other very hard. Then Charley cries 'Mr. Longfellow! Hoo-ra-a-a-a-a-a-e!' Two other shrill voices repeat the sentiment, and the little glasses are drained to the bottom. The whole concludes with a violent rapping of the table, and a hideous barking from the little dog, who wakes up for the purpose." From Edgar Johnson, Charles Dickens: His Tragedy and Triumph.